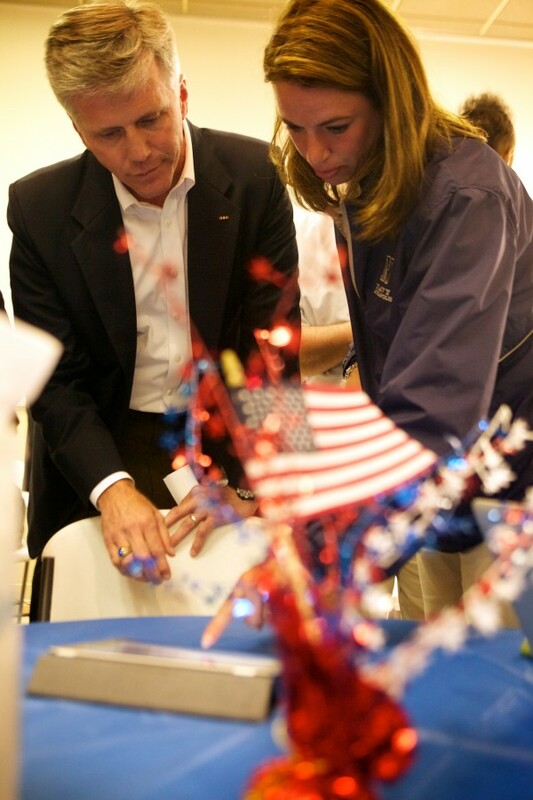 U.S. Senate Republican hopeful Charlie Summers keeps his fingers crossed at his headquarters in South Portland on Tuesday night June 12, 2012. 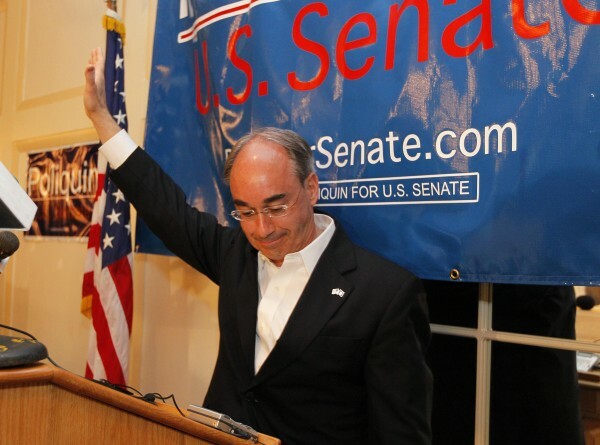 Bruce Poliquin, Republican candidate for U.S. Senate, waves after telling supporters his chances do not look good, at his election night party, Tuesday, June 12, 2012, in Augusta. 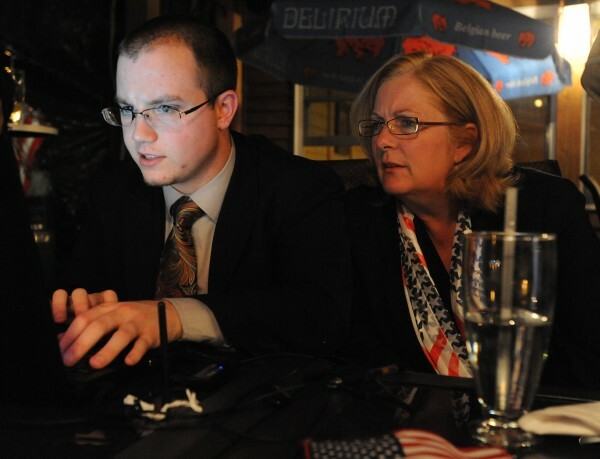 Debra Plowman (right) sits with her volunteer Ben Kelleher at McLaughlin's at the Marina restaurant in Hampden on Tuesday, June 12, 2012 watching election results come in on a laptop. 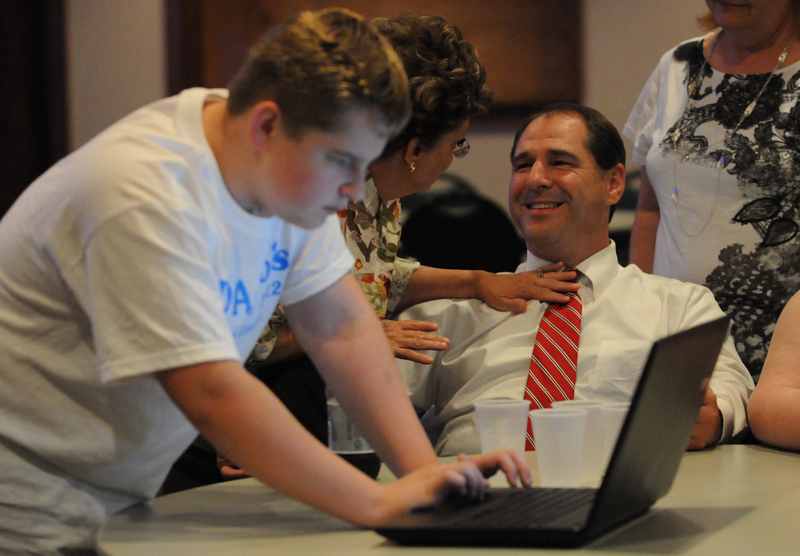 Scott D'Amboise is comforted by his mother-in-law Carol Thomas (left), as his son Gareth, uses a laptop to keep track of his father's election results on Tuesday, June 12, 2012 at Jeff's Catering in Brewer. U. S. senate candidate Rick Bennett (R) of Oxford walks around the Hilton Garden Inn in Auburn visiting with supporters as they wait for election returns on Tuesday. On right is supporter Eileen Fales of Lewiston. 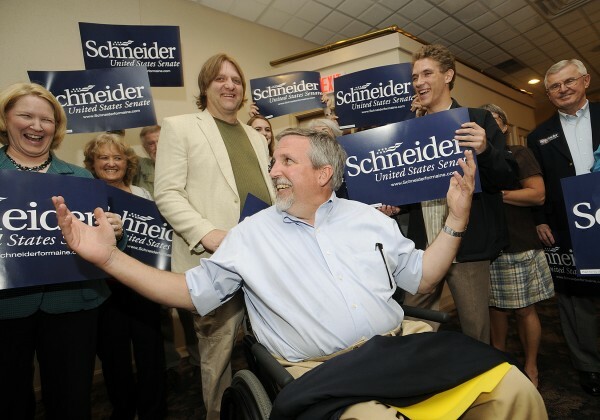 U.S. senate candidate Bill Schneider (R) of Durham is greeted by family, friends and supporters as he arrives at his campaign headquarters at the Ramada Conference Center in Lewiston on Tuesday. U.S. Senate Republican hopeful Charlie Summers checks the early returns at bangordailynews.com with wife Ruth at his headquarters in South Portland on Tuesday night June 12, 2012. 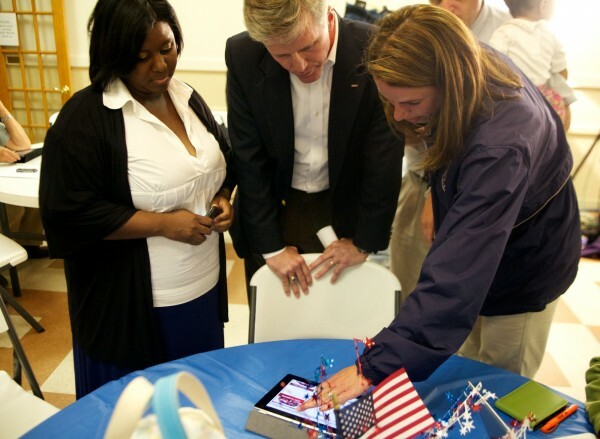 U.S. Senate Republican hopeful Charlie Summers checks early returns at bangordailynews.com with wife Ruth (right) and friend Monique Carrington at his headquarters in South Portland on Tuesday night June 12, 2012. Bruce Poliquin, Republican candidate for U.S. Senate, greets supporters at his election night party, Tuesday, June 12, 2012, in Augusta. BANGOR, Maine — Maine Secretary of State Charlie Summers emerged victorious Tuesday night in a six-way Republican primary for the U.S. Senate seat being vacated by Olympia Snowe. Summers now goes on to face Democrat Cynthia Dill and four independents, including former Gov. Angus King, in the general election in November. With 88 percent of precincts reporting, Summers led the field with 30 percent of the vote. State Treasurer Bruce Poliquin was trailing in second with 22 percent, according to an unofficial tabulation by the Bangor Daily News. See full Maine primary results here. Former state Senate President Rick Bennett of Oxford, Lisbon Falls business owner Scott D’Amboise, Assistant Senate Majority Leader Debra Plowman of Hampden and Attorney General William Schneider of Durham rounded out the bottom four spots. 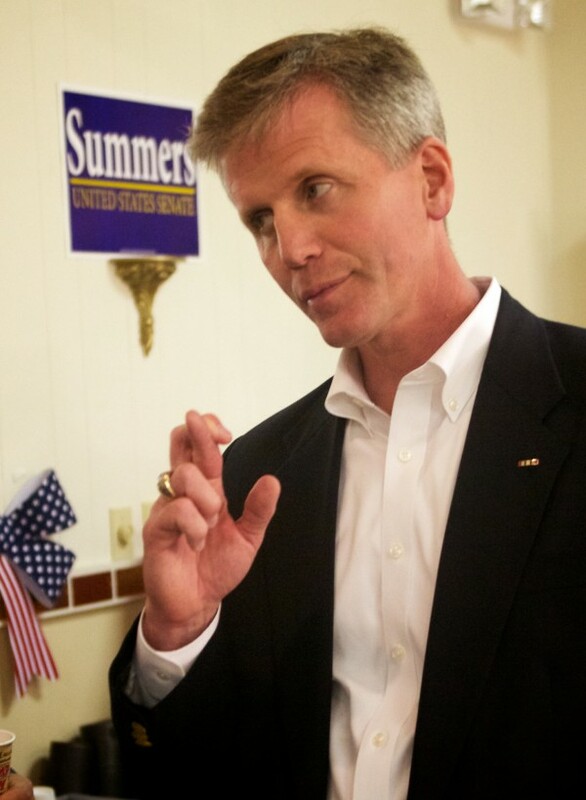 Summers, a former state lawmaker, regional Small Business Administration administrator and Navy Reserve officer who served in Iraq and Afghanistan, credited his victory to an active base of volunteers and a media campaign that were effective in getting his message to voters. “I think we were speaking to the issues, spending and debt, and I think Mainers were looking for someone who was not simply a one-dimensional candidate,” he said. Summers said he expects to make spending during King’s two terms as governor a major general election issue. Summers held a consistent — albeit, at times, slim — lead throughout the night Tuesday as election results trickled in. He won the GOP vote in eight of Maine’s 16 counties, including Cumberland, York, Kennebec, Aroostook and Washington counties. Poliquin was leading in six counties, while Bennett held a commanding lead at home in Oxford County and Plowman took the lead in her home county, Penobscot. Republicans, including Summers’ rivals in the primary, immediately coalesced around Summers. 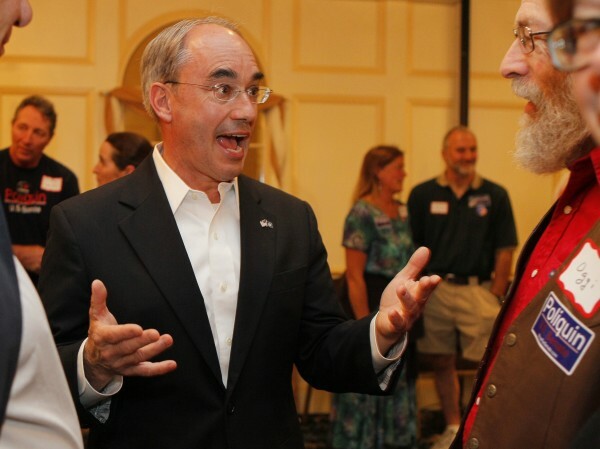 “I’ll do everything I can to help him win and make sure that this seat stays Republican,” Poliquin said late Tuesday at his election night party in Augusta. “While claiming to be an independent, Angus King is proving to be anything but,” the statement read. King said Tuesday night that the primary results wouldn’t have much of an impact on his November strategy. The voting lineup in the Republican contest didn’t exactly correspond with fundraising by the six Republican candidates. Summers had raised only $90,000 for his campaign through May 23, placing him fourth among his rivals. D’Amboise, the only candidate who was in the Republican primary race before Snowe announced her retirement, led fundraising overall, generating almost $700,000 for his campaign, followed by Poliquin with $229,000, then Bennett with $184,000, according to reports the campaigns filed with the Federal Election Commission. Poliquin also benefited in the last week of the campaign from a $30,000 infusion of outside cash from the conservative FreedomWorks for America political action committee. The $30,000 covered the costs of online ads, door hangers and phone calls to voters on Poliquin’s behalf. At an American Legion Post in Waterville on Tuesday, Republican voters interviewed by the Bangor Daily News fell in Summers’ camp. Jonathan Talbot said he was most familiar with Summers and that his name recognition from his previous runs for Congress could bode well for Republicans in the general election. Still, Talbot said, he’s not too optimistic about his party’s chances in November. “I’m pretty confident that both of the people I voted for would lose in November,” he said, also referring to Republican Jon Courtney, who was locked in a tight primary battle with Patrick Calder on Tuesday night to take on Democratic U.S. Rep. Chellie Pingree for her seat. Clare Milton said she made up her mind after watching the six Republicans debate during a televised forum co-sponsored by the BDN and WCSH-TV. 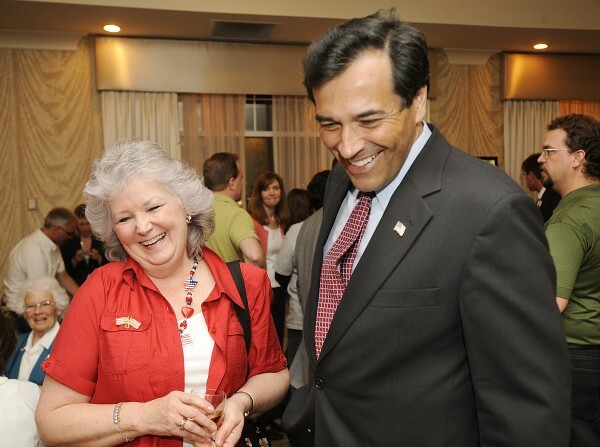 She was impressed by Summers’ debate performance and his work as secretary of state pushing for stricter teenage driving laws. But a Republican vote in June doesn’t necessarily mean a Republican vote in November, Milton said.